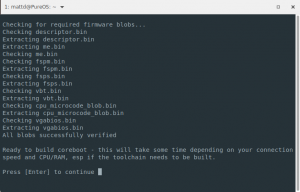 coreboot is a modern, lightweight, open-source replacement for the proprietary (usually UEFI) system firmware shipped on most PCs/laptops today. It is designed to perform only the minimum number of tasks necessary to initialize the hardware, and pairs with a payload (such as SeaBIOS) to boot a modern operating system (such as PureOS) as quickly as possible. It brings increased performance and security, avoiding widespread security issues (see “What the CIA Vault 7 Documents Mean“, follow-up posts #1, #2, #3, etc. ), and provides the foundation for our new PureBoot firmware, which offers a tamper-resistant boot process via Heads and a Librem Key and is now available as a public beta. Since the summer of 2017, Purism has shipped coreboot firmware (featuring SeaBIOS as the payload) on all Librem laptops. 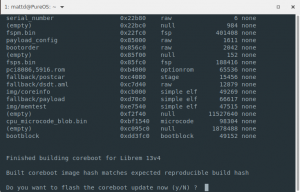 We also offer an easy to use coreboot update/flashing script for all Librem models (including those older models which didn’t ship with coreboot). This script allows you to update the firmware on your Librem, using either a pre-built binary firmware update image or compiling from source. Pre-built images for our PureBoot firmware are available as well. The script uses only files available from public Purism repositories, and performs numerous checks to ensure the integrity of the downloaded/compiled firmware update all the way through the flashing process. Since coreboot initializes the bare metal hardware, it must be tailored specifically to every chipset and motherboard — and so each Librem model has its own unique build. You can track our progress through our contributions to coreboot, our timeline of long-term involvement with the coreboot project, and our freedom roadmap. And remember to keep things in perspective! 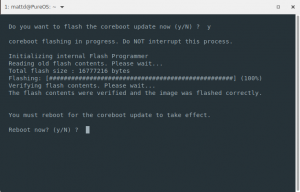 NOTE: If you have an older model Librem which shipped with proprietary AMI firmware, and your OS was installed in UEFI mode, you will need to reinstall it after, or migrate it before flashing our coreboot image (see ‘Migrating a UEFI-based install’ below). Purism offers an easy to use coreboot update script, which provides users of our “standard” coreboot/SeaBIOS firmware the option between using a pre-built firmware image, or building the update from source. Users wishing to test our beta PureBoot firmware can also do so, using a pre-built firmware image (building PureBoot from source is also possible, but not yet integrated into the main coreboot update script). 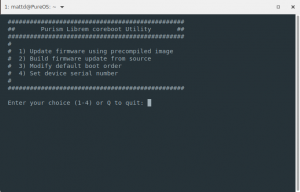 After selecting/verifying your Librem model, the script will give you the option between the “standard” coreboot/SeaBIOS firmware and the beta PureBoot (coreboot/Heads) firmware. Note: this option is not currently available for the older Broadwell-based Librem models (13 v1 and 15 v2). The firmware type selection menu will skipped if either of those models is selected. At this point, the script will download and validate the appropriate firmware image based on selections to this point. 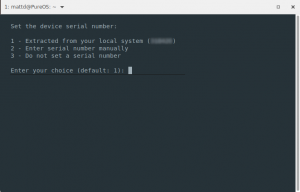 If the standard coreboot/SeaBIOS firmware option was selected, the script will prompt to set the default boot order. 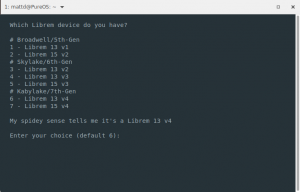 If your Librem has multiple internal storage drives, you will need to ensure your boot device has the higher priority between the two. You may also wish to prioritize external/USB devices when attached (by default, external devices have the lowest priority). Selecting a device moves it to the top of the list; when you are happy with the ordering, simply press enter to continue. As noted in the script, one can always override the default by pressing ESC on the boot splash and selecting the device to be booted. Lastly, if running coreboot/SeaBIOS firmware, the script will prompt you to flash the update. If running PureBoot firmware, the script will prompt you to copy the update to USB and to update via the Heads menu option. If the option to flash the update is chosen, the script will check for a compatible version of flashrom, download/compile from source if needed, and then flash the update. You will be prompted to reboot when it has completed (~2 mins) and should do so. Currently this function only supports building our standard coreboot/SeaBIOS firmware. We plan on adding support to build the PureBoot firmware soon. Until then, instructions to do so can be found in the main PureBoot documentation. Next, the script will clone Purism’s coreboot repository using git, then check for the required firmware blobs (downloading a pre-built coreboot image and extracting from it as needed). Once that is completed, the script will inform the user that it is ready to build coreboot, and that it may take some time (due to needing to compile coreboot’s toolchain first). After you hit enter, the build process will kick off, validating/building coreboot’s toolchain, then building coreboot itself for the selected device. Once it has completed, the contents of the firmware will be printed, and the hash of the compiled image will be compared against the expected/known good hash. If the hash matches the expected value, and if currently running coreboot/SeaBIOS firmware, the script will prompt you to flash the update. If running the PureBoot firmware, the script will prompt you to copy the update to USB and to update via the Heads menu option. If you have any questions, or if you just want to know more about the coreboot utility/update script, you may also want to check out the main forum thread for it. 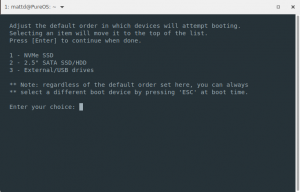 If you want to feel warm and fuzzy by confirming you have coreboot installed properly after you see the cool Purism logo during boot, here is an easy to confirm coreboot booted and was installed properly. 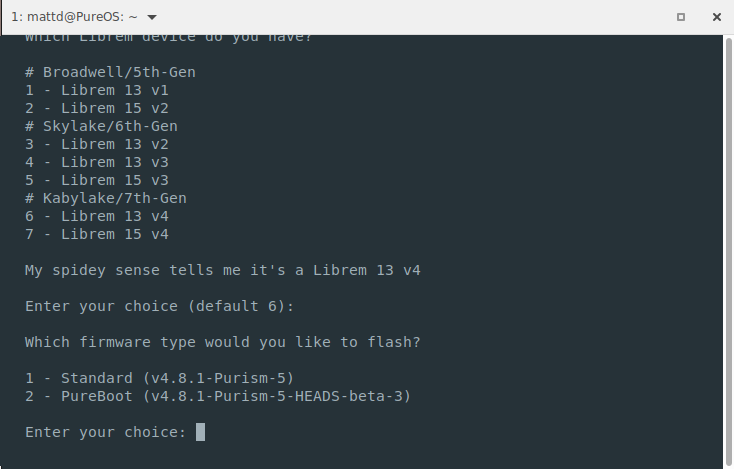 sudo ./cbmem -c | egrep -i "coreboot-|purism|librem"
Disclaimer: ME neutralization and disablement is an ongoing and repeated effort requiring tailored work across different models and chipsets (for example, we once found the ME cleaner tool to cause problems with Wi-Fi on Skylake, and had to solve that first). Using gparted, apply the “bios_grub” flag to the new target partition. You can find more advanced techniques or explanations in the GRUB documentation on Arch Linux’s wiki or AskUbuntu question #360543.